In everyday conversations, you speak differently than how I do, your boss does, or even your favorite morning barista! How you speak, write, text, email, and ultimately communicate with your audience is one of the most important drivers behind shaping and defining your brand and the appeal of your community. As a brand, your communication style can act as a major superpower - one that can help you build trust with your audience, attract the right prospects, and even differentiate you from your competition. This is widely known as a brand’s voice and tone, and defining your brand’s voice and tone is key for communicating your message effectively and consistently across all of your communication channels. 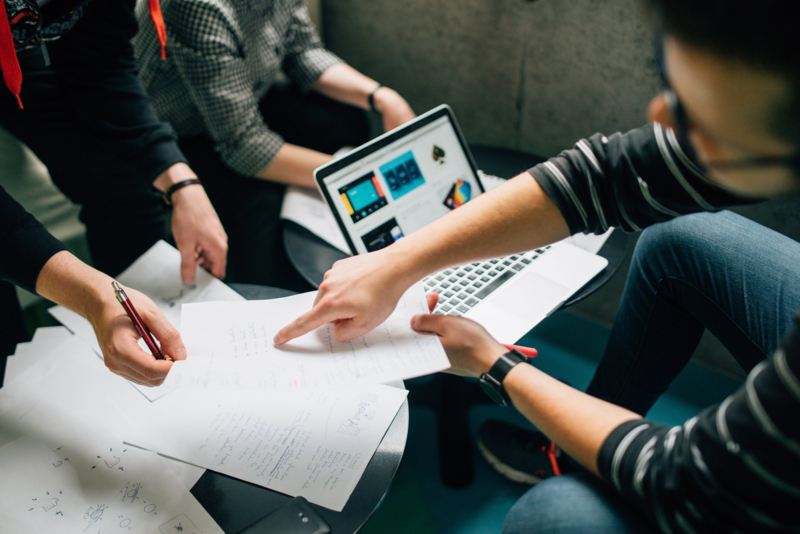 In this post, we’re going to take you through the process of crafting and shaping a voice and tone for your brand that will amplify your message, resonate with your audience, and take your brand to a whole new level. But before we jump in, let’s all get on the same page with the widely misunderstood concept of branding. Now take this with a grain of salt, there’s a good chance that your current branding strategy isn’t reaching its potential. Often times, there is a focus on the brand’s design while at the same time neglecting the overall brand experience past the first initial impression. Your brand is not your logo, the colors you use, or the aesthetic of your website. Instead, all of those concepts are design elements. Yes, design certainly contributes to your brand and the brand experience, but it does not define your brand. But then, you may ask, what is branding? For example, someone can look attractive at first impression, similar to your websites aesthetic and the user’s first impression when initially visiting your website, however, over a period of time, when the newness wears off, people can become more or less attractive based on their actions, interactions, or perceptions. The point is, your brand is your reputation. It is something that is established over time and constantly evolving, just as you and your business would. Okay, now that we have established the gist of what branding really is, let's dive into defining voice and tone and how exactly to shape them for your community. Think about Gap Inc., the company behind Gap, Banana Republic, and Old Navy, three distinct brands with distinct audiences. The Gap brand appeals to a broad array of customers, Banana Republic targets a more sophisticated and business-focused audience, while Old Navy looks to attract families. The three brands also have differing price points thus appealing to different audiences. Banana Republic is set at the highest price point while Old Navy is set at the lowest, and thus attracts customers depending upon their individual budget. 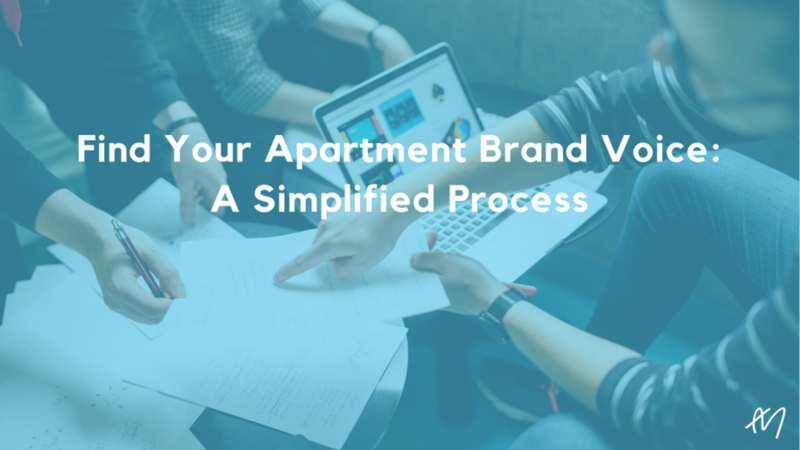 Any type of branding, including establishing a voice, requires a different process in the multifamily industry. Even though all three brands are controlled by the same overarching company, you can see by reading their individual websites or even walking into the individual stores that each brand speaks to its customers in different ways. For example, Old Navy speaks to younger customers and families so they have to be fun and lively. While, Banana Republic can (and should) tone it back to reflect a cool, sophisticated identity. In short, they want their customers to feel like the company speaks to the qualities that they see (or aspire to see) in themselves. What are Voice and Tone? Now that we’ve discussed what branding is, where do you start when defining your brand’s voice and tone? A great starting point is taking a look at the Mailchimp website. Mailchimp, well-known for their consistent and effective brand voice, keeps a public-facing copy of its voice and tone guidelines in the Mailchimp Content Style Guide. For most brands, the voice “exploration” process starts with your brand’s strategic identity, defining things like your values, core beliefs, etc. Then, that brand would work backwards to find its voice. Voice begins by looking at the basic building blocks, leads to the creation of the brand voice, and ultimately depends on the target audience. It’s easy to confuse voice with tone and vice versa. And although they do work together, they are two distinct concepts. If I gave two writers the same detailed outline of an essay and asked them to transform it into a piece of writing, I’d get two completely different essays. Voice is what makes your writing unique, helping you stand out and differentiate yourself from the rest of the crowd. Now connecting voice to branding, Brand Voice reflects things like your brand's personality, character, attitude, and values. Ideally, it enhances those elements. Your tone depends on the context of your writing. For example, the text you send to a close friend has a far different tone than the email you write to your boss. Taking a different tone doesn’t mean you’re being disingenuous, it means you’re being cognizant of the circumstances. If you have a well-defined voice, your readers should know it’s you regardless of the tone you’re taking. There’s a key difference here between The Gap brand and individual apartment buildings though, because prospective renters aren’t as concerned with your parent company (the brand behind the brand). In fact, according to SatisFacts Online Renter Study, when asked if they’d consider renting at an apartment community because of the property management company’s brand name, 80% of renters nationwide said no. Of course, you’ll want your renters to feel good about renting from you as a company. But in reality, your renters have much more emotion invested in your individual building and neighborhood rather than your management company. So what does all this have to do with voice? Your voice should tap into your prospects’ emotions. And if what they’re most emotionally invested in is your building, you have to start there. Of course, pushing the emotional buttons of a retired couple versus a young professional requires two different approaches. So, you’ll have to anchor your voice within the framework of your renter personas. What’s more, your voice, your logo, your building, even the neighborhood, should all work together to convey a unified message to potential renters. If that sounds like a lot of work, don’t worry. We’ll take you through it step-by-step. Chances are, before you even opened your doors, you had a specific renter demographic in mind; you had a clear vision and a great understanding of the target market for your building. 1. Tour your community as though you’re a prospect. What are your gut feelings? Is this an active neighborhood? Does the building feel luxurious? Could you imagine kids living here? Ask them the same questions you asked yourself in the first step of this exploration process. Write down as much as you can. Try not to filter anything. That’s for later. Also, have your co-workers talk about the community. Keep it open-ended so they’re not filtering themselves. Because agents are interacting with prospects on a very personal level, you’ll likely gain some valuable insights by picking their brain. Ask them the same questions you asked yourself in step one or simply ask them who they think the main prospect is. Also, how would they categorize different types of renters and what they’re looking for? A renter persona is a fictional representation of your targeted renters. Hubspot provides a great template for building out your renter personas. While building these out takes some time, they’re a vital tool for finding and maintaining your voice. Finding the right voice for your apartment community is as much about trial and error as it is anything else. That doesn’t mean you shouldn’t do your diligence up front to get it as close to perfect as possible. But, best practices and gut feelings only take us so far. 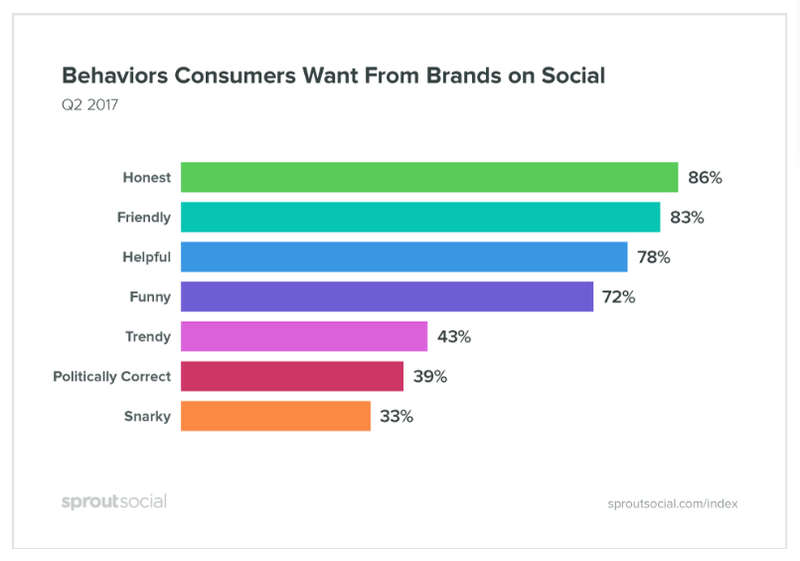 Through this Sprout Social graphic, you can understand the wide variety of consumer preferences as it relates to brands on social media. Best practices and gut feelings are a good starting point, but may not be the right fit for your audience. As the graphic shows, being honest, friendly, and helpful are pretty universal. But just because only 33 percent of consumers want snarky behavior doesn’t mean it’s never the right answer. So always remain open to opportunities for your voice to evolve (even if you don’t like it). In the beginning of the previous step of this voice exploration, your world was wide open. You could go anywhere, you could do anything. Now, since you’ve toured your building, thought about its selling points, interviewed co-workers, and put yourself in your renter’s shoes, you’ve narrowed it down. However, you’re not the only one who will be responsible for breathing life into this voice. So now’s the time to bring in other content creators and salespeople and start defining things a bit more. Even if salespeople won’t be actively writing content, sales and marketing must be aligned to establish a consistent voice. 1. Have everyone write down as many voice characteristics as they can think of. Use this list of 638 personality traits if you’re struggling to come up with characteristics. Note: You’ll have to sort through this list, so if you have a large team, limit everyone to ten to fifteen characteristics. 2. Once everyone has their list, go through the characteristics and look for the most common ones. If there aren’t lots of common characteristics, choose similar ones and group them together. 3. Narrow the list down to three to five different characteristics. If there are too many and no one can agree on which to cut out, find out which voice characteristics your team feels most comfortable writing in. If all else fails, that should narrow it down. At this point, you should have three to five characteristics to describe your voice. Just as importantly, your content creators should also feel comfortable using this voice. Because in this next step, we’re going to put a framework into place that will inform present and future content creators on how to implement your brand voice. Establishing a well-defined, consistent brand voice is difficult, but it’s well worth it. According to Lucidpress, the average revenue increase attributed to consistent brand presentation is 23 percent. But knowing you should get your team to present a consistent brand voice and actually getting them to do it are two different things. To help you with that, we’re going to permanently borrow a diagram that the Content Marketing Institute suggests using to pin down your brand’s voice. Creating a brand voice chart will force you and your team to establish voice guidelines. The idea with this chart is to put details about your voice down in writing. The genius of it is in the “do” and “don’t” column. Where most people would probably choose a word like “passionate” to characterize their voice and then describe it, this chart takes it a step further. If you chose “passionate” as your characteristic, you have to write down what it actually means to use this voice characteristic. And just as importantly, what it doesn’t mean. Have everyone create this chart for themselves, then reconvene and discuss. Once you’ve all agreed on your voice characteristics, what those characteristics mean and what they don’t mean, print out copies of this chart and put it near everyone’s desk. Just like Mailchimp’s Content Style Guide, developing a content guide can be an incredible tool for your company to maintain your brand’s voice and facilitate consistency across every communication channel. The idea is to create an editorial process in which content is edited for voice. Either by having an editor approve each piece, or you can introduce self-governance for your writers to save time and avoid clunky approval processes. 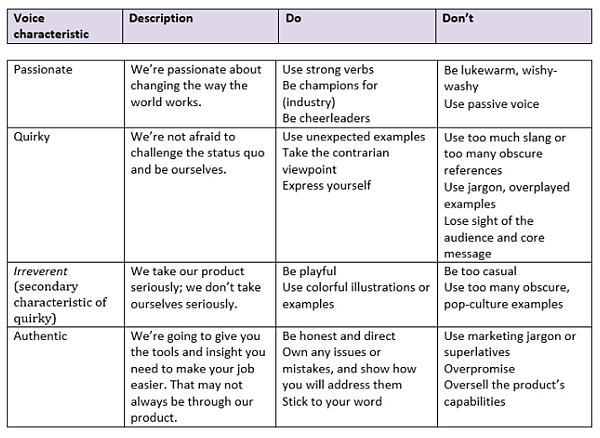 To introduce self-governance, you can rework the brand voice chart you created earlier into a checklist similar to the one listed below. Every piece of content, whether it's on social media or in an email, should check the boxes you create for yourself. To ensure that every writer is in line with the voice you established, have them run through a checklist like this for each voice characteristic every time they write something. Like a boy entering adolescence, as time goes by, your voice will change. However, if you’re paying attention to engagement metrics on email, social media, and your website, you’ll discover opportunities to evolve your brand’s voice towards perfection. Establishing your brand’s voice is not an exact science. But, with our modern ability to monitor user behavior, there’s no reason we can’t continue to make better and better guesses as we continue to learn about our audience. So don’t treat this as a one-and-done process. Continue to revisit, optimize, hone in, and improve your brand’s voice. Continue to gather information and learn about your target audience and what specifically you can do to attract them. By defining your brand’s voice and tone with the target audience in mind, you are creating their dream space and leaving them with no option but to move in with you. If you have a good idea of your brand’s voice and tone, launch your social media and blogging game. Get in front of your target audience and continue to let your brand evolve naturally.